I am aware that this anime has some history and that some people will be fairly familiar with the subject matter here. I’m not one of them. I’d never heard of this one until the promotional materials for the Winter season started floating around and even then I only kind of paid it a vague kind of attention. As such, I went in fairly cold though the tags of psychological and mystery seemed like it might be something I’d really enjoy. It is hard to judge an anime, any anime, on its first episode alone but honestly the best description I can think of for this first episode is ‘sedate’. We meander about watching a few interactions between characters, some rumours and whispers, and hear about missing girls and monsters, and then it is all over and Boogiepop leaves. We don’t really know how or why it resolved other than it did and it seems like things aren’t actually resolved at all. There’s a strategy at play here and anyone new to the material will be wondering now just where this is going. There’s certainly lots of intriguing questions about the mystery, about Boogiepop, and even just about the ‘normal’ characters we’ve encountered. The question is whether or not this episode succeeded in being interesting enough to make the audience care about pursuing those questions. Realistically, that’s borderline for me. The opening song was pretty average to dull (though it might grow on me), the animation and character designs are also pretty average. 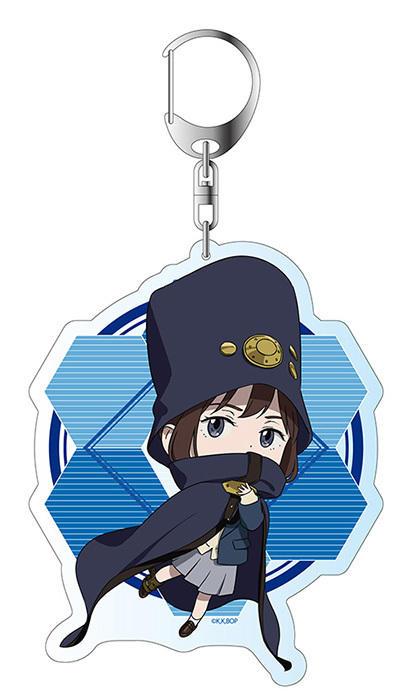 So far none of the characters have particularly grabbed my interest, not even the cloak and hat wearing Boogiepop and I don’t think I can recall a single other character name. I’m going to give this one a bit more time because it does feel like this might go somewhere and it’s listed genres are ones I usually enjoy. Still, if there isn’t a noticeable pick up in the next couple of episodes or something that really hooks me I’ll probably leave this one. I’d love to know your thoughts about this first episode. Did you enjoy it? Did you find it a bit slow? Leave us a comment below. That outfit and that face are enough for me to want to watch the show. I really love them. It certainly looks like it should be more interesting than it ends up being. Yeah, it’s the biggest problem – the episode doesn’t really work as an attractant. There’re some intriguing things, but they’re very few and far between. That’s probably why they had to release the second episode more or less at the same time. I think having to wait a week I may have just decided to let this go and move on. Oh, I haven’t thought about that, but it does make a lot of sense. Though usually in such cases they release a double-length episode, not two in a row. I found this episode to be boring and confusing. I’ll reserve my complete judgement until I watch the second episode. Boring and confusing seems to be a fairly general consensus of this first episode. I’m not too hopeful for the second episode, but maybe it will be better. It is actually better. It fills in some of the gaps of episode 1 and starts giving us more information about the missing girls so it sort of lends some coherence to some of the things mentioned in episode 1. I also think outside of Boogiepop, so few of the characters did anything memorable. I’m fine with the characters looking more normal but none of their actions really stuck either. Mostly I just vaguely remember boyfriend guy, book girl, girl who was absent… Hopefully some of them start to be distinct soon because otherwise this story is going to be hard to follow. Only watched one episode for reference, but I honestly was hoping I’d find an explanation of what I just watched before going onto the next. It seems that by reading the comments, the second episode resolves some of these things, which is a good thing these episodes were released together. Although, I don’t think it bodes well for the series if it continues these issues when this won’t happen for any of the futures ones. Honestly, I am at the point where I could take the show or leave it, as it hasn’t done anything for me thus far. I’m going to give episode 2 a chance, as I was hyped when I saw this adaptation was announced given its history, but I’m not hopeful for the future of this series based on what I saw. That’s more or less where I’ve ended up. I’m giving it a shot but if I end up with enough other shows on my watch list I’ll probably drop this one (unless it noticeably picks up). FWIW, my wife watched it as this kinda stuff is normally right up her alley. She dropped it about three-quarters of the way through the first ep. The second episode did help this along and filled in some of the gaps from episode one. Still, I don’t blame her. I think I only really stuck this one out because not much else has aired and there was a bit of hype around this. My episode two review will be out later and I definitely enjoyed it more. I’ve seen Boogiepop Phantom a LOOOOOOOOOOOOOOOOONG TIME ago, wonder if this is a reboot of some sort. This is a reboot but as I have no familiarity with the original it is all new to me. I haven’t seen it yet but I’m willing to give it a shot given at how interesting the PV was for this remake. I’m always hungry for a supernatural mystery anime. I’ll for sure let you know what I think once I see the first episode! My review of the second episode will go out tomorrow. Second episode definitely helped.